Fused in sarcoma (FUS) is an RNA-binding protein involved in pathogenesis of several neurodegenerative diseases. Aggregation of mislocalized FUS into non-amyloid inclusions is believed to be pivotal in the development of cell dysfunction, but the mechanism of their formation is unclear. Using transient expression of a panel of deletion and chimeric FUS variants in various cultured cells, we demonstrated that FUS accumulating in the cytoplasm nucleates a novel type of RNA granules, FUS granules (FGs), that are structurally similar but not identical to physiological RNA transport granules. Formation of FGs requires FUS N-terminal prion-like domain and the ability to bind specific RNAs. 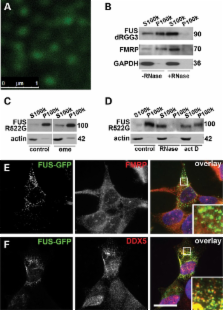 Clustering of FGs coupled with further recruitment of RNA and proteins produce larger structures, FUS aggregates (FAs), that resemble but are clearly distinct from stress granules. In conditions of attenuated transcription, FAs lose RNA and dissociate into RNA-free FUS complexes that become precursors of large aggresome-like structures. We propose a model of multistep FUS aggregation involving RNA-dependent and RNA-independent stages. This model can be extrapolated to formation of pathological inclusions in human FUSopathies. Eukaryotic cells contain assemblies of RNAs and proteins termed RNA granules. Many proteins within these bodies contain KH or RRM RNA-binding domains as well as low complexity (LC) sequences of unknown function. We discovered that exposure of cell or tissue lysates to a biotinylated isoxazole (b-isox) chemical precipitated hundreds of RNA-binding proteins with significant overlap to the constituents of RNA granules. The LC sequences within these proteins are both necessary and sufficient for b-isox-mediated aggregation, and these domains can undergo a concentration-dependent phase transition to a hydrogel-like state in the absence of the chemical. X-ray diffraction and EM studies revealed the hydrogels to be composed of uniformly polymerized amyloid-like fibers. Unlike pathogenic fibers, the LC sequence-based polymers described here are dynamic and accommodate heterotypic polymerization. These observations offer a framework for understanding the function of LC sequences as well as an organizing principle for cellular structures that are not membrane bound. Copyright © 2012 Elsevier Inc. All rights reserved. With the recent recognition of non-coding RNAs (ncRNAs) flanking many genes1-5, a central issue is to fully understand their potential roles in regulated gene transcription programs, possibly through different mechanisms6-12. Here, we report that an RNA-binding protein, TLS, serves as a key transcriptional regulatory sensor of DNA damage signals that, based on its allosteric modulation by RNA, specifically binds to and inhibits CBP/p300 HAT activities on a repressed gene target, cyclin D1 (CCND1). Recruitment of TLS to the CCND1 promoter to cause gene-specific repression is directed by single stranded, low copy number ncRNA transcripts tethered to the 5′ regulatory regions of CCND1 that are induced in response to DNA damage signals. Our data suggest that signal-induced ncRNAs localized to regulatory regions of transcription units can act cooperatively as selective ligands, recruiting and modulating the activities of distinct classes of RNA binding co-regulators in response to specific signals, providing an unexpected ncRNA/RNA-binding protein-based strategy to integrate transcriptional programs. Copyright statement: © The Author 2014. Published by Oxford University Press. Autonomously replicating RNA in mitochondria of maize plants with S-type cytoplasm. Control of mRNA turnover: implication of cytoplasmic RNA granules.